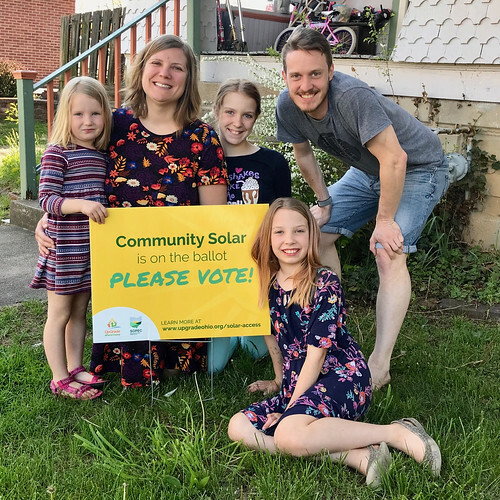 Driving along the rolling township roads of Appalachian Ohio, it’s easy to understand the opposition to community solar being whispered beyond the fence lines. This is proud and powerful coal country, after all, and clean energy might just as well be a dirty word, outside the busted-out barns where shale gas wells abound. The story doesn’t change much if you are traveling west from Washington and on into Meigs counties. But once you make your way into Athens, the landscape opens wide with shimmering rooftop solar panels and ground mounts that reach toward an open blue sky. Here in Athens, researchers will share their bright-colored slides and multilens perspectives on how the boom-and-bust cycles of natural extraction have beaten down these teeny tiny towns. They gather for coffee Uptown or for drinks at Casa Nueva, knowing full well that fresh community-driven ideas are the only way to move the solar narrative. Outside the working-class base of the Donald Trump faithful, do they really think they can convince an entire Appalachian community to rally behind a carbon fee that could pay for community solar on public buildings? Surely that’s a mouthful, but I know that’s what they’re thinking. I realize I’m getting way ahead of myself, so maybe I need to go back to the beginning of the story so you see where it all began. As a middle-aged marketer, I never thought I would leave Akron to join a group of folks who are trying to drive demand for clean energy in Appalachia. There I go, saying goodbye to the urban life, just to talk to small businesses and farmers about increasing their energy efficiency and their knowledge about solar, geothermal and biomethane technologies. It’s not always easy to gain a listening ear from a community built around oil and gas exploration. People don’t know what they don’t know, and big industry is rumored to own a lot of people in these small towns. Some folks will only listen if your last name bears a familiar ring. You could say we’re getting used to the rejection, but despite the opinions of hard-nosed industry outsiders, some of the people of Appalachia would like a different story told. I am that somebody, who at 52, decided to apply as an AmeriCorps VISTA and serve during President Obama’s 50th anniversary year. I moved to a coal-mining town in West Virginia to work for Conservation Legacy and the U.S. Department of the Interior, and when it was all finished, I took a short break and headed to the Ohio Pawpaw Festival, just outside of Athens. 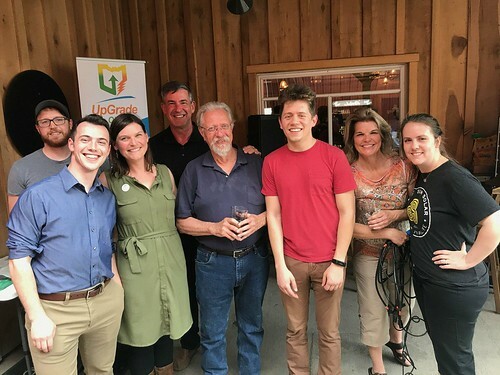 During the festival, I stopped by the Energy Village, where people wanted me to meet the people at UpGrade Ohio, a small nonprofit that is bringing alternative-energy development to Athens and neighboring coal-impacted communities. 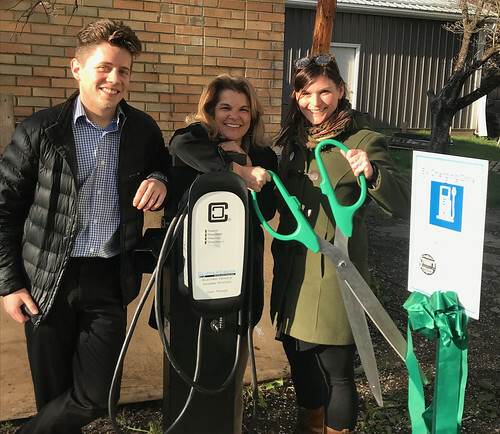 They work with the Southeast Ohio Public Energy Council (SOPEC), a council of governments made up of mayors who wanted to improve the regional energy economy through community choice aggregation. Together, they were educating the citizens of Appalachia about renewable power, which can be a difficult concept to wrap your head around. UpGrade Ohio began after a group of folks from Athens County decided to compete for the Georgetown University Energy Prize. In an effort to win a $5 million purse, the group encouraged residents to lower their collective energy costs. Athens didn’t end up winning the grand prize, but they managed to form a clean energy nonprofit to expand their programs. They partnered with SOPEC and applied for a USDA Renewable Energy Development Assistance grant. 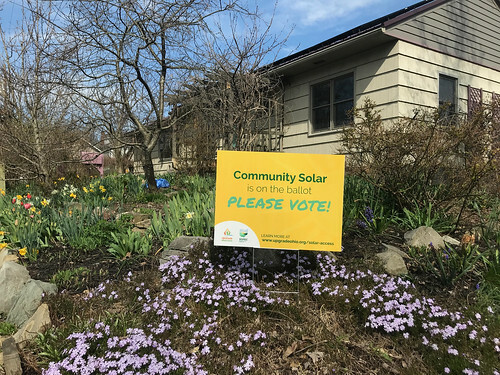 By early 2017, they were competing in DOE’s Solar in Your Community Challenge, a $5 million competition to expand solar access to low- and moderate-income communities. This time on their radar: Finding a creative way to fund a community PV install, a 700+kW array for the Federal Hocking Secondary School. The competition is still ongoing. A key directive of the competition is to figure out a way to serve disadvantaged populations with reliable solar power now and in the future. 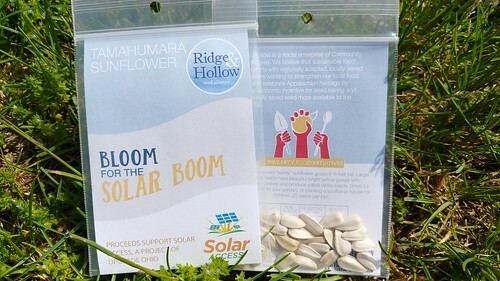 UpGrade and SOPEC got to work, creating the Solar ACCESS brand around a citizen-funded program so that anyone could support the growth of solar. A lot of ideas floated around the conference rooms, but nothing seemed to stick like the Athens City Carbon Fee. Ben Lachman, cofounder of Athens energy startup Potential Labs, shows support for the carbon fee initiative with his family. When you contract for a start-up nonprofit, you tend to wear multiple hats. I am used to looking at scopes of work, but here projects change every day. Athens, I am thinking. A carbon fee? I go back to thinking about the Athens identity I’ve come to know, built around hardworking homesteaders, hippie farmers, and hard-partying undergrads. I was hesitant myself, even given the potential backing of a strong liberal populace. Asking residents who live in a city with one of the highest poverty rates in Ohio to pay a little more for their electricity every month was not going to be easy. It’s almost like trying to sell ice cubes to Eskimos, I think, or some such overused expression. Apparently I didn’t know Athens, they told me, so I would do my best to understand. The first hurdle was to take a look at what a carbon fee actually looked like. Do we want to call it a tax or a fee? My colleague Mat Roberts liked to call it a solar surcharge that could be used to generate funds for projects in the city. But the real nitty-gritty fell on the shoulders of Eddie Smith and Sarah Conley-Ballew, two young start-up executive directors. Eddie heads the Southeast Ohio Public Energy Council and Sarah oversees the projects over at UpGrade. The initial text for the program centered on SOPEC’s community aggregation program. Ohio is one of seven states where community choice is legal, and the fee would only apply to residents who enrolled in SOPEC’s community program. I think aggregation is a confusing term. To me, it’s just another fancy word for saying bulk purchase deal, which SOPEC negotiates with AEP Ohio or others on behalf of the region’s residential and small commercial customer accounts. On paper, the carbon fee is based on average home energy use. Here in Athens, maybe a resident would agree to pay a partial carbon fee of 0.2¢/kWh, which equals somewhere between $1.60 and $1.80 extra a month on his or her electric bill. This would be much less than a full carbon fee of around $21.60 to $24.30 a month. Folks who understand the economic impact of carbon emission damages might be open to a fee that incentivizes them to use less energy. So if residents wanted to lower their partial fee, they could agree to be more energy minded and reduce their energy usage every day. And if folks simply disliked the idea from the start, they could opt out of community aggregation altogether. This now was a workable deal. We would host three community forums in April and one final party in May five days before the big vote. We printed out voter lists and asked ambassadors to knock on doors. Several Athens townies came forward to say they were happy to place campaign signs in their yards and they would take some to give to neighbors. Would We Really Be the First Ever? We knew we had the support of some pretty influential people in Athens, but we didn’t know how many. One thing was clear: A lot of undecided voters were confused about community aggregation and retail supply. Some attended our local event at Christ Lutheran Church and brought their utility bills, asking for clarification on fees and riders. The companies they were complaining about were completely unrelated to SOPEC’s initiative, so we were there to give a quick lesson on energy generation, transmission, and distribution. Most didn’t realize that SOPEC’s program was different from the Standard Service Offer (SSO), or the “bargain” that retail supply companies were offering. They had to understand that this community-driven alternative had two primary components. First, the SOPEC initiative looked at the economic impact of carbon emissions and at the city’s interest in reducing energy to meet its long-term sustainability goals. Second, the plan would drive economic development by investing community solar on public-facing buildings. Any utility savings generated by the solar were extra icing on the cake, with dollars being invested into much-needed city-driven projects. We weren’t here to hide behind complicated riders. A carbon fee wrapped around a layer of community solar could have been a burrito option at Casa if you ask me. Our church event proved to be a key opportunity to educate older residents who needed a better explanation. This is where UpGrade really shines. When you know you have an option and you’re not getting hit over the head with a change made at the corporate level, you won’t feel blindsided. SOPEC wanted this to be an advisory ballot measure, which is why it wanted to hold these forums in the first place. We valued the opinions of everyone, and few folks seemed to be opposed to the measure. Or did they? Soon, we discovered that every single one of our bright yellow campaign signs along public right-of-ways had gone missing. How big was the opposition, we wondered? Clearly there would be some people against the fee, but every single one gone, within a day or a matter of hours? This was a primary election after all, and we hadn’t anticipated a fight. The beauty of the carbon fee was that it wouldn’t impact everyone in the city—only residents who were enrolled in SOPEC’s community aggregation program. So voters could essentially vote for the measure, but if they decided not to participate, they didn’t have to enroll or they could choose to opt out. As the vote drew near, we had to prepare one more event so we could make our final push. It had to be something that would capture the spirit of what we hoped to accomplish. We decided to create an event around the signing of a resolution that happened 40 years ago, on May 3, 1978. Former President Jimmy Carter had declared the day Sun Day, asking others to advocate for the benefits of solar year after year. Carter’s anniversary happened to fall on the last day of classes at Ohio University, so people would be up for drinking beer, we thought. There we were celebrating the first-ever Athens Solar Day five days before the election. We gathered at Jackie O’s Taproom, a crowd favorite where the owner had installed solar to reduce his own energy costs. On the day of the election, we decided to rotate shifts at key polling locations and text each other our progress during the day. I showed up at the Dairy Barn in the early hours, coffee and lawn chair firmly in hand, ready for a long day. Car after car rolled by, waving as they pulled into the long driveway, giving me two thumbs up as they entered. Athens City Mayor Steve Patterson was all smiles and hopeful, slowing down to give a quick hello, maybe a little tentative about what the day might bring. I worry about the people who don’t make eye contact with me or wave my smile away. I feel really good, I thought. But it would be bad luck if I show it. We stared at our phones and kept tapping our collective refresh buttons just to see the latest updates. 7:30 p.m. Nothing. No results. Tap, tap, tap. Learn more about the Athens City Carbon Fee. We jumped off our bar stools, gleeful! We hugged each other, looking around the bar in disbelief. Is this true? Seventy-six percent of Athens City voters said yes to a carbon fee? We went to bed that night, exhausted, happy, and victorious. Anything is possible in sweet, humble Appalachia. This was clearly a very special moment that a lot of folks will never forget. Maria Dimengo is a freelance writer living in Appalachia. She received a bachelor of arts in journalism and a master’s in nonprofit management.